Discussion in 'Mountain Bikes' started by mtb passion, Jul 20, 2018. Pindus, same as any place in Greece, has a rich tradition and history, with plenty of mythological references linked to its name. 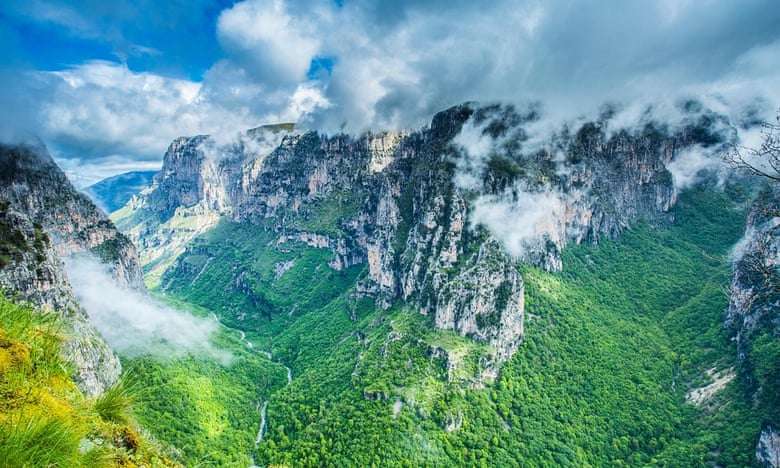 Of particular interest are two mythological traditions regarding the largest mountain range in Greece. An ancient king had two sons. When the passed away, the eldest son and legitimate successor resigned from his right to the throne and decided to move to the mountains to live a peaceful life. In the mountains he met a dragon with whom, he became close friends. The throne ended up with the youngest brother. However the new king, fearing that the older brother will return at some point to reclaim the throne, decided to gather an army in order to find and exterminate his brother. The king chased with passion and eventually managed to exterminat his older brother. What he had not taken into account was the dragon, who soon after discovered the body of his murdered friend. The dragon was outraged, and soon he began to attack with fury against the king and his forces, and he did not stop until none had been left alive, neither the king nor any of his soldiers. The legend says that the name of the older brother was Pindus and the mountains that he chose to live were named after him. According to another legend a dragon lived in the mountain range of Tymphis, who had an alpine lake for his home. But he also had an opponent, a dragon in the opposite of Smolikas, also who lived in his own lake. The two dragons hated each other deeply and tried to exterminate one another at every opportunity. Legend has it that the two dragons throw stones and trunks to each other, from one top to the other, until one of them manages to exterminate his hateful enemy.